India’s house at the Old Bakehouse. The afternoon rain ceased just in time to allow the usual jolly party. The house was converted into flats by Wootton Bros, my father’s company. 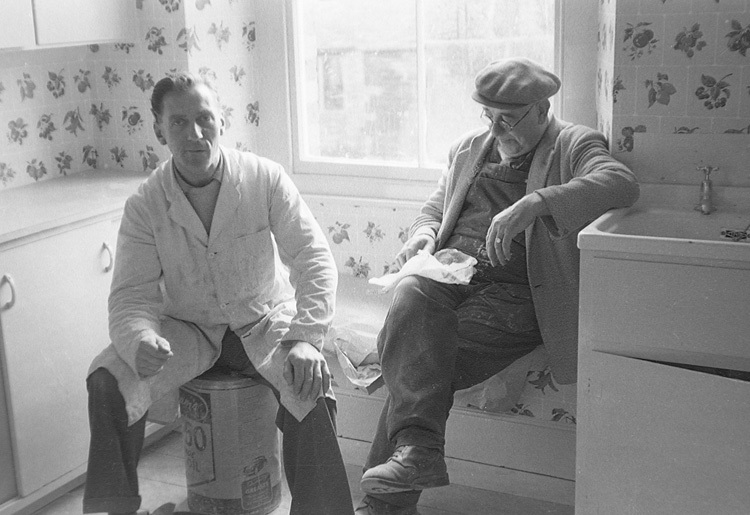 Here painters Harold Wootton and Fred Pollintine take a break in the kitchen of the first floor flat. Molly and I moved into the flat as newly-weds in 1961. The winter of 1963 was one of the coldest on record. At that time the flats above and below us were unoccupied and there was no heating other than a two bar electric fire in the kitchen and a coal fire in the lounge. We were both at work and so the latter was only lit at weekends and had little impact on the temperature. The interior of the window in our bedroom froze over early in January and remained frozen for more than a month. Likewise the pipes to the bedroom washbasin froze solidly and nothing would induce them to unfreeze. Fortunately someone had given us an electric blanket as a wedding present. Initially I had treated this with a degree of youthful derision but came to love it dearly. More than once by morning we found that condensation on the outer surface of the blanket had frozen solid! After days with the temperature continuously well below zero, a vicious easterly wind blew up and a 24 hour blizzard followed in which neither man nor beast could move. When the wind finally moderated, my normal daily route to Strutt and Parker’s office in Oxford looked like this, on the way to Stuchbury…. ….and this was the situation at the Magpie…. There were no snowploughs in the village at that time. As highway authority the Northamptonshire County Council had appointed “snow officers” for each parish. As proprietor of the family building business, employing numbers of local men, this task fell to my father. A phone call to County Hall confirmed that he was to set men on at three shillings (15p) an hour. Within a day or so a route was cleared to the Magpie to link up with roads cleared by men from other parishes and the occasional snowplough. Attention then turned to the Helmdon Road as shown in the following pictures. Book in hand, the “snow officer” on his way to keep account of men employed and hours worked. Overnight the easterly wind returned and much of the work had to be repeated. An emergency call was received by my father to the effect that a cattle truck with driver and two bullocks was stuck in the snow along the Welsh lane. Together with John Young, the village football team’s goalkeeper (leaning on shovel in above picture) and another member of the team, I was sent off to the rescue. We made good progress across the ice hard surface of the fields, scoured clear of snow by the wind. Our shovels were used to protect our faces from continuous wind-driven icy particles. The truck driver was more than a little pleased to see us and a couple of hours of pushing and digging where necessary brought us to a track up to a farm, which shall remain nameless. Before digging a way in we struggled up to the farmhouse door, demanding “shelter from the stormy blast” or words to that effect. “Go away”, was the reply, “we don’t have enough fodder for our own animals!”. Somewhat taken aback, we continued with our task and finally the thankful driver was taken into a another farmhouse kitchen and the beasts turned into a barn and fed. For over a month, this was the view of the road to Helmdon on my daily drive to Oxford…. ….and when it became obvious that there was to be no thaw, further gangs were sent to dig passing places. It was a terribly hard winter for the wild animals. This hare crept up to our garden fence…. …..and joined a pigeon in making what it could of some frozen greens. Both would have assuredly been shot and eaten during wartime rationing, but thankfully those days were almost twenty years behind us and the animals were left to survive as best they could. Sadly, it was not unknown for starving birds to freeze to death on their perches and simply fall to the ground…. This entry was posted on Wednesday, December 14th, 2016 at 9:56 am	and is filed under News. You can follow any responses to this entry through the RSS 2.0 feed. You can leave a response, or trackback from your own site.